A new pocket-sized virtual reality camera has been unveiled this week in the form of the TwoEyes VR 360 camera which has been created by HunJoo Song based in Los Angeles California. The mini virtual reality camera has been designed to be the very first Binocular 360 degree VR 4K Camera that is capable of mirroring the view from a human eye and is capable of capturing VR, 3D or 360 degree imagery with ease. Watch the demonstration video below to learn more about the new virtual reality camera which is taken to Kickstarter this week to raise the $40,000 the team required to take the VR camera into production. The development team behind the TwoEyes VR 360 camera explain more about its features, inspiration and design. Meet TwoEyes VR, the first 360° 4K video camera that truly mirrors human eyesight. TwoEyes VR is equipped with two pairs of 180° lenses that are placed 65 mm apart, which is the average distance between people’s eyes. This design, allows you to capture 360° around just like your natural eyes would view the world. Relive special moments with unparalleled realism through 360 social media platforms (Youtube 360, Facebook 360, Twitter 360), VR binoculars or 3D television. TwoEyes VR offers two distinct modes. When you begin recording, if you hold TwoEyes VR vertically, it will film utilizing only two lenses in “One-eye Mode.” Essentially, this will film videos in the same way as other 360° cameras on the market. 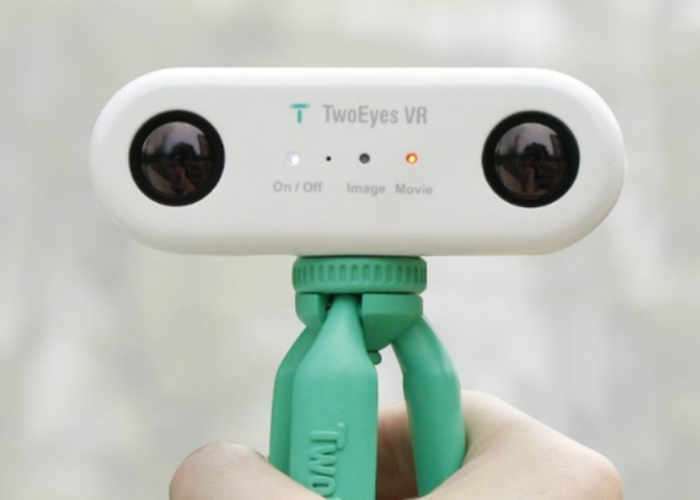 If you hold TwoEyes VR horizontally, it will record with all four lenses in “Two-eyes Mode.” The embedded gyro sensor will automatically detect how you are holding TwoEyes VR. In “Two-eyes Mode” you will be capable of recording stunningly realistic 3D video. Control TwoEyes VR manually through its simple two-button shooting controls or remotely through the companion application. Once you are finished shooting, you can edit it into different modes (VR, 360° or 3D). Share your content with friends or family on various social media platforms directly from the TwoEyes application. Sharing can be done instantaneously to Instagram or 360 compatible platforms such as Facebook 360 & Youtube 360.